← Spinach-Celery-Turmeric-Lemon Soup: A Wee Taste of Scotland? Do you need another chocolate chip cookie recipe for your arsenal? I really was not looking for one – beyond the America’s Test Kitchen recipe, about which I already have written here. However, sometimes I am compelled to try a variant or new recipe just for fun. The October issue of Saveur featured Amanda Hesser’s Flat and Chewy Chocolate Chip Cookie, excerpted from her latest publication, The Essential New York Times Cookbook. This is a wonderful cookbook, I must tell you, even though I have yet to make anything else from it after receiving it at Xmas – the recipes span the more than 150 years the NYT has been publishing on food. Also in that edition of Saveur, my favourite food writers Jane and Michael Stern wrote about some of the glories of central Ohio cuisine. There are many varied and delightful specialties in that area of the Buckeye State, some of which I have sampled on road trips. I liked the Stern’s description of a tantalizing chicken noodle soup recipe from a Polish restaurant, Babuska’s Kitchen. The recipe included directions for home-made noodles – something I had never done before – and seasonings for the soup such as fennel seed and garlic, neither of which I typically use. It was a super-soup recipe, which I recently made for dinner on a blustery rainy Friday night – to be capped off with more comfort food: chocolate-chip cookies. Thick and chewy (e.g., the ATK version). Flat and crisp (more akin to the original Tollhouse Recipe – the ancestor of all the others). Cakey – I will not bother to even “go there”, as this is one I choose to marginalize…call me whatever name you like for doing so, but I believe this consistency is undesirable in chocolate chip cookies (I like my cakes cakey, thank you very much, but, please, not for my cookies or brownies). Brown butter – this version can be part of the above categories, though I am not sure it could produce all textures (e.g.,. the thick and chewy version — I tried once with brown butter and it did not turn out quite right). Thus, I decided to try another chocolate-chip cookie recipe. I am more than satisfied with the ATK version, in all its chewy chocolate-chip glory: it is the perfect classic thick and chewy cookie. The flat-and-chewy version, however, is decidedly distinct. 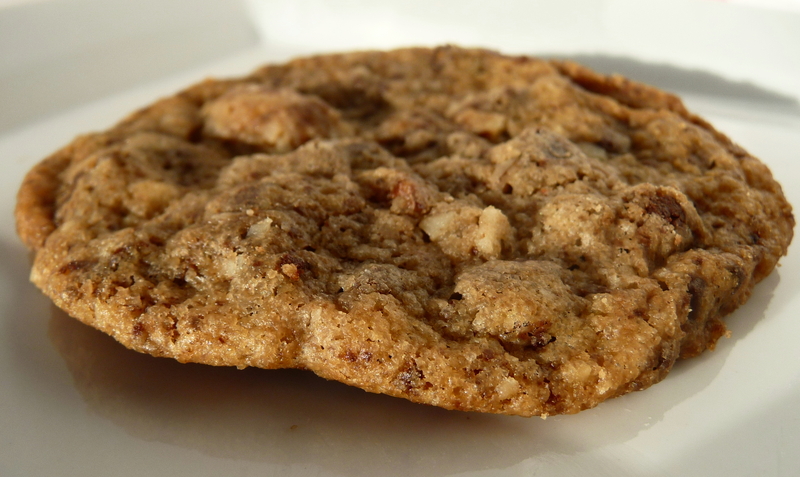 It struck me as more of a European cookie, though perhaps this was because I happened to substitute almonds for the walnuts – hazelnuts would make it even more Continental. 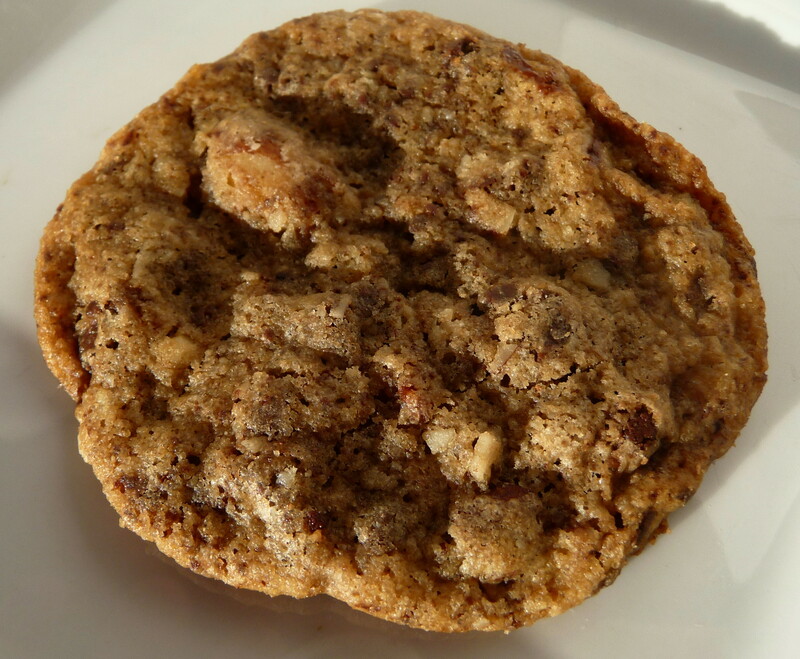 The cookie is very elegant: the ground nuts provide additional chewiness but additional textural contrast to the chocolate and more subtle flavour inter-mingled with the cookie dough, chocolate, and salt. My substitutions were the almonds, as I had mentioned, as well as just using good quality chocolate chips, which I buzzed in a mini-food processor to create a texture comparable to chocolate shavings. These both worked well for me, and I would try the recipe with the shaved chocolate and/or the original walnut or hazelnuts – or pecans, for that matter. 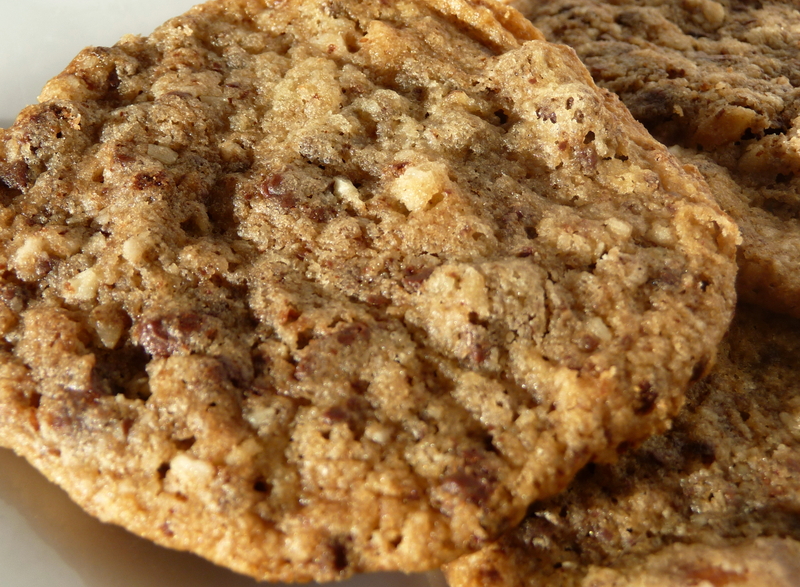 Unless one is allergic to nuts or cannot stand them, I think the almonds added so much character that I do not agree with Ms. Hesser’s making them “optional” – one could leave them out for a much less chewy and flavourful cookie, as opposed to many recipes in which their absence would not have nearly as much of an impact. The only draw-back is that the recipe is a bit time-consuming, as opposed to some very easy chocolate chip cookies. This flat-and-chewy version, however, will be the only other chocolate chip cookie recipe I now will bake with any regularity. However, I doubt that these two will be the last I chocolate-chip cookie recipes l ever try, as one always can continue searching for one more great recipe. 1. Line two baking sheets with parchment paper, Silpat, or your favourite silicone non-stick liners. Whisk together the flour, baking soda and salt. 2. In the bowl of a stand mixer, cream the butter and sugars together until fluffy, about 3 minutes (this can be done by hand or with a hand-mixer, as well). Add the eggs, one at a time, then the vanilla. Add the flour mixture all at once and blend together on the lowest speed, just until a dough forms. Fold in the chocolate and nuts, on the lowest speed just until blended. Chill the dough for at least one-half hour (the dough can be refrigerated for several days in advance). 3. Preheat the oven to 325 degrees. Roll 2 1/2 tablespoons of the chilled dough into a ball, then place it on the baking sheet and flatten to 1/2-inch-thick discs spaced 2 inches apart (I used a juice glass, the bottom of which I dipped in lukewarm water between pressings to ensure the dough did not stick). 4. Bake until the edges are golden brown, 14 to 16 minutes. Be sure not to overbake, as you will lose the chewiness in texture. Let cool slightly on the baking sheet, then transfer to a baking rack. 5. Enjoy warm or at room temperature, while thinking of your other favourite chocolate chip cookies. This entry was posted in Baking, Cookies, Dessert, Recipes Misc and tagged Baking, Chewy, Chocolate Chip, Cookie, Dessert, Recipe. Bookmark the permalink. Great looking cookie! I got The Essential New York Times Cookbook, too! So far, I’ve enjoyed reading it, but I haven’t cooked from it a lot…yet! We did enjoy the Pepper-Cumin Cookies from the book. Very easy, and an interesting flavor combination. I love the look of your Flat and Chewy Chocolate Chip Cookies! Will definitely keep them in mind. Thanks, Kath. I liked the sound of the pepper-cumin cookies, too, as the spices are intriguing. Do let me know if you give the CC cookies a go! 2 “official” chocolate chip recipes? Your baking life is complete! I kept meaning to make these from the Saveur article, but I guess subsequent issues of Saveur made me lose focus! I love your in-depth review of the recipe — you’ve convinced me to make it happen this weekend. Hi, Theresa. I am glad you’ve given me so much feedback – I do hope the cookie works as well for you as the deep-dish pizza! I love the idea of a chocolate chip cookie that can be flat and still chewy at the same time. They look delicious. I’m starting a new linky on my blog this Saturday called “Sweets for a Saturday,” and I’d like to invite you to stop by then if you have a chance and link this up. Thanks, Lisa, for stopping by and leaving a comment. I’ll check out your “linky”. Hi, Jennifer. I appreciate your stopping by. Chocolate chip cookies are my all-time favorite snack, and these look like a perfect new one to add to my snack list. Hi, Geni. 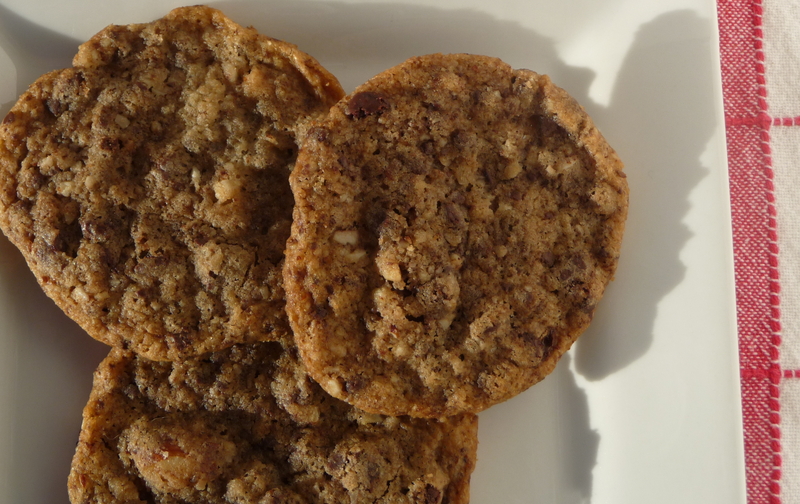 Yes, you should try this recipe for a change from the more typical CC cookies. I bet you’d like them. The cookie sounds delicious and you have me intrigued by the cookbook, I’ll have to check it out. I love the tweaks you made, grinding the chocolate up seems like a great idea. Thanks, Louann. Your encouragement is very thoughtful. I’m sure you’d enjoy the cookie and the cookbook alike! If it’s going to be a European cookie then one must call it a biscuit, my dear! Regardless of what you choose to call it, this looks good. I personally like my cookies/biscuits soft and chewy in the middle but cookies are often a slight disaster with me – too crispy and burnt, so if this is a good ‘un then I’d be tempted to try it! Hi, Jax. I do “get” the biscuit thing (in the UK and anywhere in la francophonie), but it is just my Amurikan-upbringin’ which makes me think of the delights of the US’s deep south as the real biscuit (the round scone-like fluffy thangs?). I wonder what those “biscuits” are called in the biscuit-as-cookie places?!? Thanks, Jax. It is pronounced with either a long or a short “o”, as we both well know! This is going on my t0-bake list – and I’d love to try it with hazelnuts. Flat and chewy sounds just about ideal to me, cookie-wise. I really want this cookbook too! Hi, Jeannette. I think you’ll enjoy both the cookies and the wonderful cookbook in which they’re found.